The message is clear: to master something, one must commit with fierce passion. This we can all agree with, especially in the regard of CrossFit. It takes an unbreakable will, never mind countless hours and sacrifices. It demands our best foot forward, every time. We can become borderline obsessed, said with all the positive connotations, with our goals. And we drive towards them with fervor, until we reach the goal… losing the percentage of bodyfat, gaining the pull-up, and anything in between. But can we take this skill that weâ€™ve refined, this dedication to a cause, into our personal lives? Can we master, our temper? Master our ability to refrain from gossip and rumors at work? Master the will to walk the shopping cart back to where it belongs after putting the groceries in the car, despite how no one is in the parking lot to even notice? What can we commit to this week? 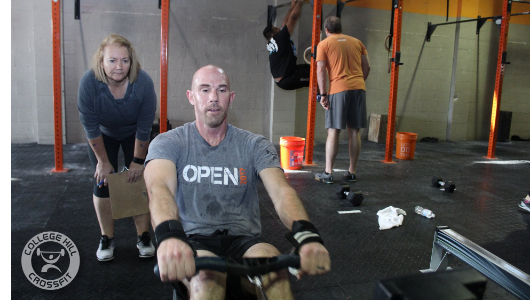 A “Cluster” is short for a squat clean thruster. A full squat clean, that moves directly into a thruster without a pause anywhere in the motion.